Lindsay Bolcar is the mother of three and a lover of beautiful fabrics. She enjoys making hair scarves, bow ties and bows for her community. Originally, she created them for close friends, but now she sells her adorable designs locally at Pepper Place. Also, she sells internationally on her Etsy shop. Follow her Instagram page, @lindsaybrookb, to see her precious products modeled by happy customers. Why did you decide to create hair scarves, bows and bow ties for a living? It was actually kind of an accident that I became a small business owner. About three years ago, a couple of my friends asked me if I could make them some hair scarves and bow ties for Easter. I did, and I loved it! I started scouring the local thrift stores for discarded clothing items I could turn into my accessories, and began adding items to my Etsy shop. The next year, I decided to start attending local festivals and craft fairs with my items, and the response was great. My business has grown steadily in the last three years, as I’ve had the ability to devote more and more time to it, and I’m so thankful that God has given me this opportunity to help support my family by working at something that I love. When did you first start sewing and creating unique products? is so exhilarating to me! I still get the a thrill when I sew up an item and it’s different or better than I expected when I began making it. What do you feel like your bright patterns reflect about your business? I love finding a totally unique fabric at the thrift store, or using a commercially produced fabric in an unusual way, to create something brand new. I think my customers appreciate that the accessories I sell are really unique, too. They know they won’t be able to find anything like them in a big box store, and they get excited to see what new patterns I have. Which product have customers loved the most? It really depends on the season, as far as my best selling product. 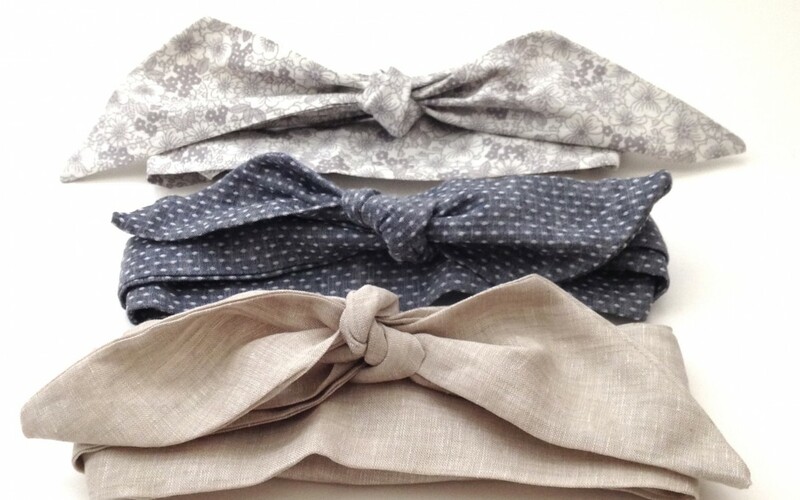 Bow ties are a big hit in the spring, for Easter and Father’s Day. This year, I rolled out my collection of custom made neck ties as well, and they have been well-received. In the summer, hair scarves are my biggest seller, as ladies are looking for a chic way to keep their hair out of the way in the summer humidity and heat. What is your favorite part of being a vendor at Pepper Place? Well, this is an easy question! Hands down, my favorite part of selling at Pepper Place is having the opportunity to meet and interact with my customers and fellow artisans on a regular basis. The people of Birmingham are so warm and friendly, and I’m looking forward to a great season at Pepper Place.